The third video in the series is on custom helmet airbrushing. The guys at Kal Koncepts take 4 helmets, and show the layouts, spraying, airbrushing, and pinstriping needed to complete some seriously kewl, and moneymaking designs. These three videos are a must have for any kustom painter looking to up his skills, and learn new, and innovative technqiues. 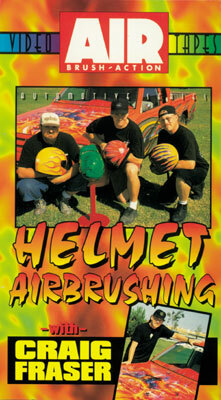 The first helmet painting video available in the kustom industry, it still remains one of the best sellers.